This is an absolutely classic breakfast that never fails to please me. It’s so simple and easy yet there’s something very luxurious about it. I quite often make this as a special treat breakfast for The Boyfriend but to be honest it’s not that rare a thing as I make it at home whenever we’ve got smoked salmon in. Whenever I’m making scrambled eggs or an omelette, I absolutely have to put fresh herbs in it, they go brilliantly with eggs and really lift the flavour. I usually use whatever I happen to have in the fridge at the time and in this instance I used basil as we currently have a plant on the window sill. Dill would be my number one choice though, it goes with both the salmon and the eggs so perfectly, it’s ideal for this dish. 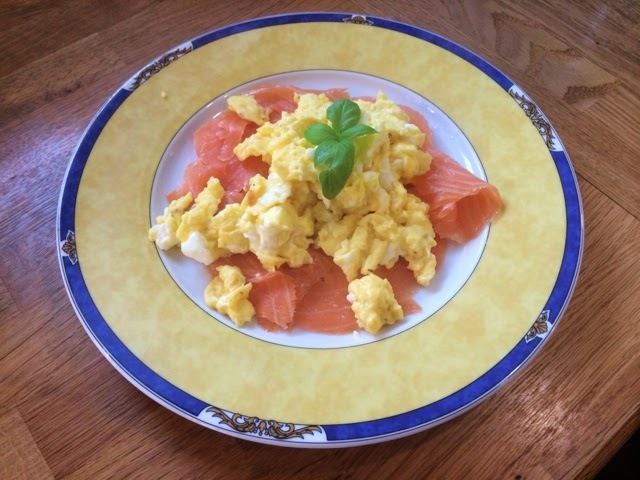 High in protein and low in calories this is an absolutely ideal healthy breakfast which is fantastic as most things we have as a treat are really bad for you. 1. In a frying pan heat a small amount of oil on a medium heat. 2. While the pan warms up beat the two eggs, add the milk and season with salt and pepper. 3. Pour the eggs into the pan and allow to set ever so slightly around the edges before you begin stirring. Continue to stir, breaking up the mixture so it doesn’t set into an omelette. 4. How much you cook it is really down to personal taste, I don’t like my scrambled eggs runny but I also don’t want them to go too solid and spongey. I cook them until they’ve just all set and there are no more runny bits. For The Boyfriend I let the eggs get a bit of a golden colour on them as that’s how he likes it. 5. Arrange your smoked salmon slices in a ring on your plate and dish up the eggs in the middle. Garnish with the fresh herbs.